Adapting to the damaging effects of climate change, plants are gradually moving to where temperatures are cooler, rainfall is greater, freshwater is available or other conditions are ideal. The researcher is studying the effects of sea level rise on Florida mangroves and their ecosystems. 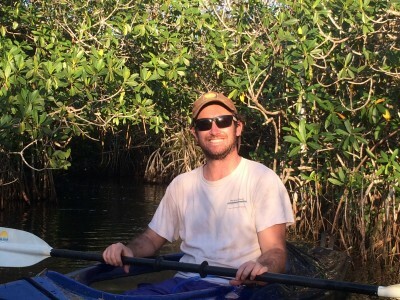 On a local scale, FIU biology student Sean Charles is examining how mangroves in the Florida Everglades are impacting the ecosystem around them as they gradually move inland from saltwater to freshwater communities. For now, this tactic is helping the plants keep up with salt water intrusion caused by sea level rise. Wetland ecosystems like the Florida Everglades provide a number of services that benefit people, including flood control, water purification, and carbon accumulation that removes harmful carbon dioxide from the atmosphere. Charles’ study specifically looks at how vegetation shifts and sea level rise, combined with ongoing restoration efforts, will impact ecosystem functions, soil elevation and the Everglades’ ability to store carbon. His research project is funded by the Everglades Foundation FIU ForEverglades Scholarship. In addition to improving what is known about interactions among mangroves and their environment, Charles wants to informing Everglades conservation and restoration. He is also engaging K-12 students in Collier and Miami-Dade counties in a coastal plant restoration project. Known as “Marsh-Mangress,” the public school students will grow mangrove seedlings on school grounds until they are established and ready to be planted at local restoration sites. “By learning through participating in active restoration projects, students will be engaged in the importance of environmental conservation. and will, hopefully, better understand their role in it,” Charles said. Photo Above: Biology student Sean Charles enjoys kayaking in the Everglades.